Do the actions under discussion qualify as torture? Should the actions have been taken? The former is, perforce, incredibly boring because it's a purely legal argument hinging on definitions and processes. Very few people want to have a discussion about the difference between self-executing treaties and non-self-executing treaties - and in any case it's all rather beside the point, since just because something is legal doesn't make it right. The latter question is actually quite interesting - but Stewart kept refocusing on the first question. This strikes me as incredibly obtuse on Stewart's part (or, I should say, his scriptwriters), and it essentially eviscerated the entire discussion. It might make things clearer if you ask yourself how you'd react to a 5 - 4 Supreme Court determination that waterboarding was not torture and not illegal under US law. Would you react by going "Oh, okay," and support expanding its use in the future? I doubt it. A rather more normal response would be to say "Well, maybe so - but it's still wrong!" Stewart mentions that the US has prosecuted people for waterboarding. This is true, but rather beside the point. First, the obvious - if you are a critic of waterboarding, would you change your mind if it turned out that the US had never prosecuted anyone for waterboarding? Again, the answer is almost certainly negative, which makes the entire discussion rather pointless. Second, however, is the point that if waterboarding isn't torture then it is at a minimum cruel and inhuman and thus is still illegal in almost every circumstance. So we can bring up the prosecution of an Alabama sheriff (convicted of waterboarding US citizens) or Japanese soldiers (convicted of waterboarding US prisoners of war) and we haven't actually made any progress towards answering the question of whether waterboarding is or is not torture. Moving on - May next tries to focus on other enhanced interrogation techniques such as temperature extremes and sleep deprivation. This is an important line of argument because it cuts right to the heart of the issue. Things like sleep deprivation are cruel and inhuman, they are widely illegal, and banned by international treaties. They also clearly do not fall under the definition of torture used by US law, and as such they are not categorically illegal. The question then becomes: "Are these tactics okay in sufficiently extreme circumstances?" If they are, then we are reduced to arguing over shades of grey. How extreme must the circumstances be? How cruel may the techniques be? Is waterboarding close enough to count? If they are never okay, then the issue is even simpler. If loud music shouldn't be used, then waterboarding certainly should not, so there's nothing left to debate. This is the heart of the problem, but it's also a very hard question. Saying you're against torture is easy; everyone is against torture. On the other hand it takes a fair amount of moral courage to come out for or against something like sleep deprivation. Stewart, of course, ducks the question. It's understandable, of course - he's an entertainer, and it's not his job to make hard moral choices which would - either way - undoubtedly offend some fraction of the viewers of his show. It does, however, mean that there's no real point to the ensuing discussion. If you're not prepared to actually come out and say that you think any cruel treatment of detainees is categorically wrong, then all you're left to with is non-lawyers trying to argue about legal issues they don't really understand. Charming. And that's clip 1. On to clip 2. Amusing moment - May asked Stewart if he'd let people die rather than use enhanced interrogation techniques to obtain information on forthcoming plots. Stewart's reply is a stunned "...uh....let people die?" The correct response was, of course, "Yes" or "No" depending. Stewart instead comes back with, "There is a penalty to pay for living in a free society" then tries to shift into a very safe denunciation of torture. May then manages to mousetrap Stewart into actually talking about the definition of torture. Stewart says it's not "any discomfort", which May pounces on. "So it's okay to inflict some discomfort?" Stewart panics; he knows he can't come right out and agree or disagree without losing some of his audience, but the question is too bluntly put to dodge. He ends up saying he'd follow the Geneva and UNCAT definitions, which is probably safe since it's a good bet that not 1 person in a 100 watching the discussion has the slightest idea what those documents say. In any case, Stewart is still tiptoeing around the central question. He does say that he thinks 11 days of sleep deprivation is too much - but as May rightly points out, if 11 days is too much, but some as allowable, then there must be a line where it crosses from "okay" to "torture", and that line should be written down in law or policy memos so that people do not accidentally cross over into torture. And the "torture memos" were an attempt to do exactly that. This point is important enough it's really worth repeating. After pointed questioning from May, the best that Stewart can come up with is a position completely indistinguishable from...the Bush administration. Not exactly a profile in courage. Moreover, May is correct about the Geneva convention as it applies post-Hamdan (see Hamdan vs Rumsfield). I think Hamdan was incredibly poorly decided, but it's quite clear, and it rules out violence, cruel treatment, torture, humiliation, and degrading treatment. Stewart point-blank refused to agree with restrictions that severe, then when pressed suggested that the Geneva rules should apply. Did he not know what the Geneva rules were, or did he just hope his audience didn't? Either way when called on it he agreed that Geneva restrictions should apply, which makes his earlier refusal a bit puzzling. Have I mentioned that May's speaking style annoys me recently? No? Well, consider it noted. Stewart speaks well, but his refusal to take even extremely safe positions (The Daily Show is relentlessly partisan, his audience is overwhelming Democrat, and Stewart is incredibly popular) makes it hard to hold much respect for him. Again, Stewart gives a great speech about living up to ideals. In doing so he's closely echoing comments made by both Bush and Cheney, both of whom were - like Stewart - vocally against torture. And both of whom tended - also like Stewart - to evade when pressed on what that actually meant in practice. Moving on. May tries to pin Stewart down on where to draw the line. Stewart tries to dodge, May presses, and again Stewart start to panic. "...Uh...I'd try and draw the line where our country has drawn it for 200 years." It's a good comment, but historically incoherent. 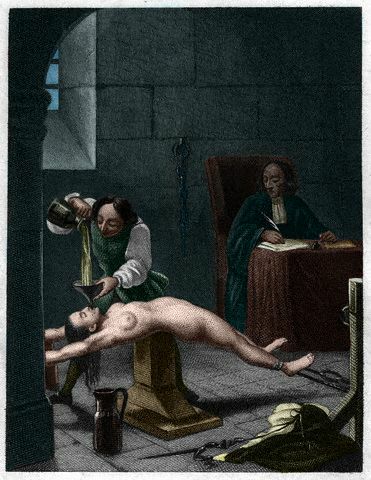 The phrase is an anachronism now, but "the 3rd degree" or "3rd degree interrogation" referred to techniques used by police to compel confessions, and included a wide range of torture techniques, including waterboarding. Torture was relatively widespread until around 1910 when public condemnation led to a decline. Waterboarding and other techniques - called "hidden 3rd degree" - that didn't leave visible marks continued until the 1940s. There was also widespread allegations of torture during the Wilson Administration, when widespread hysteria about terrorist threats led to the Palmer Raids and other abuses. And going back to the 19th century yields a rich vein of material, including - most prominently slavery. Really, Stewart's line here captures the entire problem with Stewart in a nutshell. He is extremely focused on finding things to say that will make the audience feel good - any substance his remarks may have is, at best, just a bonus. His constant references to the founders are perfect for this purpose, because they make the listeners feel good - and yet it's all quite meaningless. Of course Stewart isn't endorsing slavery; he no doubt considers it a terrible evil. But saying "we should stick to to the standards the founders adhered to when it came to rich white males" doesn't give the audience a warm fuzzy feeling, so he doesn't say it. Any nuance - or content - that might get in the way of the entertainment is discarded. Oh, Stewart has already issued an apology and full retraction for his comments about Truman. He said the comment was stupid, and he regretted it the moment it came out. I'm sure he did - it was the first thing he said which might have offended a measurable portion of his viewers. Did he believe it? Who knows? Stewart plays the role of Jon Stewart so perfectly I wonder if he actually has any personal beliefs any more. Oddly, I'd think more highly of Stewart if he'd stuck with the Truman comment. I disagreed with it, but at least it was an actual position. May comes back to the Geneva conventions. It's actually kind of amusing. May quotes Eric Holder (Obama's attorney general) in support of the proposition that the Third Geneva Convention does not apply. Stewart responds by pointing to Reagan's signing of the UNCAT in support of the proposition that...well, it's not really clear how Stewart thinks that relates. It's still funny to see Obama referenced up for the "pro-torture" point of view, while Reagan is referenced for the "anti-torture" point of view. In any case, legally both arguments are ridiculous. The argument about the Geneva Convention is precluded by Hamdan, which essentially ruled that if the US captures a Saudi national in Afghanistan it counts as a civil war, and thus the Third Convention does apply. Meanwhile the argument about UNCAT fails because the US never actually implemented the treaty. And in any case, these arguments are completely lacking in normative aspects. They are about what the law is - not what it should be - and are thus quite pointless. End of clip 2. On to clip 3. What's interesting is that May has spent most of his time trying to pin Stewart down, and Stewart has spent most of his time dodging and making sweeping statements about generalities. What May thinks is if anything less clear than what Stewart thinks, because Stewart never asked. If I didn't know better I'd say May was interviewing Stewart here. Stewart - while trying and largely failing to mock May - actually sums up everything that's wrong with his position when he paraphrases May: "If you say we can't waterboard, then we can't hold them for a night!" May correctly points out that he never said that - the question was whether Stewart thinks the Geneva conventions apply. It's an excellent question - Stewart is desperate to avoid drawing any sort of line in the sand, so he keeps looking for an external framework he can reference. The Third Geneva Convention is incredibly tempting for his purpose, but it goes too far and bans too much. Stewart can't agree that it applies, but he can't bring himself to say it does not since that would lead to the question of what standards DO apply. I find myself oddly feeling sympathy for Stewart, who seems to be caught in a trap of his own devising. Near the end Stewart also falls into one of the classic traps of the torture debate - the idea that torture doesn't work. This is a terrible argument, because it implies that if torture did work, then it would be okay. Since it's implausible that torture couldn't - at least theoretically - get useful intelligence data from someone, simply making the argument tends to weaken the position of the person making it. Stewart would be on firmer ground if he stuck with his primary argument, which is that torture is immoral. (Of course, since May - and everyone else - appears to agree with him, it's not much of an argument.) Stewart seems to realise this since immediately after raising the point he's forced to admit that it doesn't matter. Slick. Then back to "we must have boundaries because we're civilised." And yet when May tries to ask Stewart what those boundaries are, Stewart evades. Actually writing them down ends up with something much like the "torture memos". Not writing it down means that you do not have rule by law. Stewart seems like a student taking a multiple choice test, wishing there was a "none of the above" options". Ah, finally, the ending. Which is...painful. Stewart returns to his standard argument throughout, which is to make extremely vague statements about gathering intelligence "like the great country that we are." It's not clear even Stewart has any idea what that means, but it doesn't much matter, as he quickly begins chanting USA and waving his fists in the air. You must be kidding me. Well, that was an unedifying waste of time. What exactly did you find compelling in that rambling collage of drivel, shouting, and slogans? What arguments did Cliff May actually put out? With the exception of the discussion of Truman - for which he issued a grovelling apology - did Stewart actually utter one coherent and substantive sentence? Also, I believe you entirely misinterpreted Stewart's comments about bin Laden. Stewart is saying that he wanted (past tense) to do that, and he is presenting this as evidence that he "understands blood lust". In other words, Stewart is implicitly arguing that such reactions are unreasonable, and is contrasting them with the interrogation methods under discussion. Stewart is basically arguing that torture is unreasonable in the same way that cloning and killing bin Laden is unreasonable. That's the one thing you disagree with him on? I don't think so. Anyhow, to the extent that Cliff May enunciated a position, I mostly disagree with it, as he seems too focused on the choice of target, and too uninterested in internalising the implications of Hamdan. He also kept referring to detainees as "high value", which seems much too subjective to me. On the other hand Stewart didn't appear to have a position at all.